Triple Oscillator, also known as 3xOsc is a virtual subtractive-synthesis-approach softsynth that is included in the Linux MultiMedia Studio (LMMS) Digital Audio Workstation, by now a pillar in the GNU/linux audio multimedia community. It includes a generous group of presets ready for use when LMMS is started. Just click the "Instrument plugins" tab (the first little box on the left side of the screen, below the Project menu selector) and drag Triple Oscillator over to the Song Editor section. 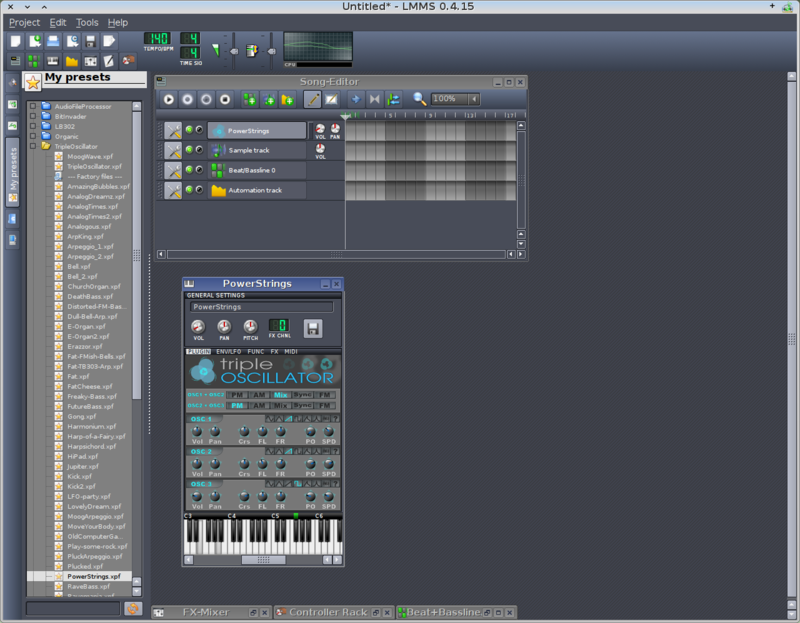 In my setup, Triple Oscillator is already the default instrument in the Editor. 3xOsc consists of three oscillators, each able to produce a variety of waveforms, including a moog-type saw wave. The waves can modulate each other through frequency (FM), phase (PM), sync or amplitude (AM). The MIX function combines two oscillators. Each oscillator can be independently adjusted for volume, panning, coarse- and fine-tuning (fine-tuning for both stereo channels), phase offset and stereo phase detuning. Triple Oscillator is polyphonic only. It has an interesting incorporated "chord" function which allows selection of a large variety of chord structures (major 7, minor 7, 6, add9, etc,as well as some unusual structures coming from various types of musical genre, including bebop, blues and arabic styling). The arpeggiator section can also utilize these chord structures in the arpeggios. The arpeggios can be used in four sequences: up, down, up and down, random. 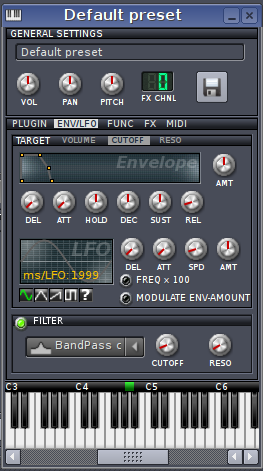 Lastly, effects chain section allows plug-in effects to be added, such as phaser, chorus, delay, etc. Monophonic capability and portamento are not provided, and the GUI is a bit small for my taste, but the synth is powerfully built and full of potential. More info about Triple Oscillator is provided in the LMMS DAW manual itself, which you can find on the LMMS website at the bottom of this page.